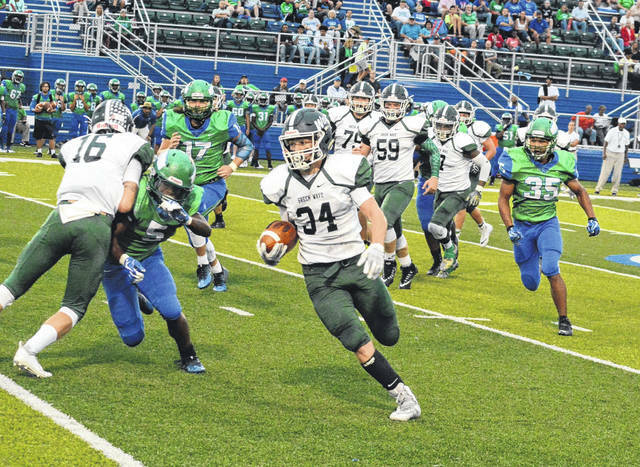 Landon Eldridge (34) had another big night for the Green Wave scoring a pair of touchdowns and running for 163 yards, albeit in a 58-16 loss to Chaminade Julienne Thursday night. 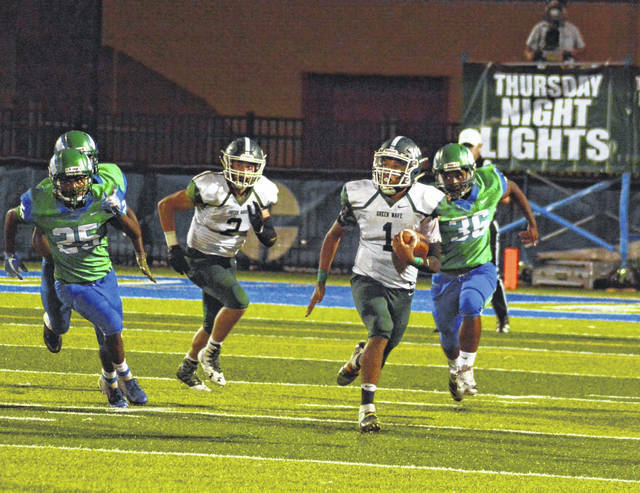 Greenville’s Di’Maurye Ewing (7) tries to run through a pair of Chaminade Julienne defenders Thursday night as the Green Wave played at the Eagles home field. CJ won the game, 58-16. Greenville quarterback Tyler Beyke (18) throws a pass out toward Marcus Wood (1) during the Green Wave’s road game at Chaminade Julienne on Thursday night. CJ handed Greenville its first loss of the season, 58-16. Greenville’s Marcus Wood (1) finds some running room during the Green Wave’s road game at Chaminade Julienne on Thursday night. The Eagles handed Greenville its first loss of the season, 58-16. 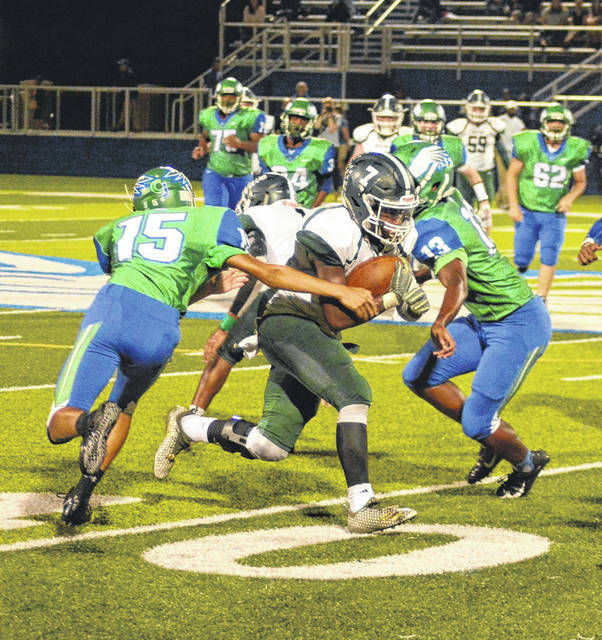 DAYTON – Greenville’s win streak came to a crashing halt against the Greater Catholic League’s Chaminade Julienne Eagles. Both teams were 2-0 going into the Thursday night game, but the Eagles scored early and often in a 58-16 victory. 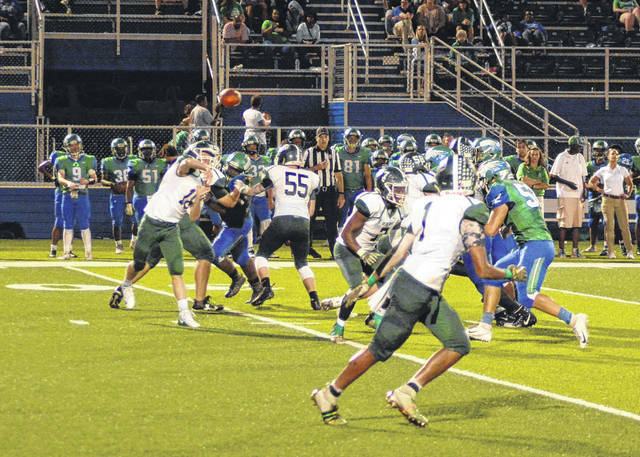 Greenville could not find an answer to the Eagles potent offense, but did manage to score on a field goal by Ethan Flanery, and two touchdowns by Landon Eldridge. The Eagles seemed to score at will. Transfer quarterback Ryan Minor threw four touchdown passes on the night. Due to being a transfer, he will only see action the first half of the season before sitting out. His favorite receiver was Dominic Wilcox, but they moved the ball on the ground as well with Quincy Johnson scoring twice. There were some bright spots for Greenville. Their first score was set up by an Eldridge carry to the 4-yard line. The Green Wave could not punch it in and Flanery kicked a 22-yard field goal making the score 14-3. However, this would be Greenville’s only score of the first half. In the second half, Greenville drove down the field on their first possession. Marcus Wood has a nice kick return to the 42-yard line of the Eagles. Then, Eldridge had a nice run to put the ball on the 1-yard line where he drove across the goal line for the first touchdown of the night for Greenville. The last score for Greenville was set up by a Tyler Beyke pass to Di’Maurye Ewing. Ewing snagged the pass and ran to the 11-yard line of the Eagles. On the next play, Eldridge had a nice 11-yard carry to score the touchdown. Eldridge ended up with 163 yards and averaged 8.2 yards per carry against a tough Eagles defense. Defensively the team did have some fourth and short stands where they forced the Eagles to turn the ball over on downs. Top tacklers for the night were: Dru Quinn (8), Ewing (7) and Wood (6). The kickoff team did recover an onside kick – Tony Sells ended up with the ball. “We faced a really good CJ team with a lot of talent,” Shaffer said. “They have a good thing going. We opened up and when things didn’t go well we made some mental mistakes. Formations – lining up, that type of thing. But as a team we have to handle adverse situations. It is easy to play football when you have some success. It’s hard to play when things are not going your way. You have to gather yourself up and get the ship headed the right direction. This entry was tagged Aaron Shaffer, Chaminade-Julienne, Dominic Wilcox, Ethan Flanery, GCL Co-ed, Green Wave, Greenville, GWOC, Landon Eldridge, Quincy Johnson, Ryan Minor. Bookmark the permalink.